CP enables your team to leave time-stamped notes regarding important conference details. The software also provides quick notifications regarding space availability. CP interfaces directly with STG’s Iris Suite Products including Iris Registration. This seamless partnership gives you the best live data possible regarding your conference registration process! We save you time with automation: contracts, confirmation letters, emails, invoices, rosters, and even assignment importing! Create custom task lists for any given conference that report to you exactly where your team is in the planning process. Store, manipulate, and search conference and participant information quickly and easily. Use custom fields to gather the information that matters the most to your operation, then generate attractive reporting based on this unique information! Create and update space reservations manually or auto-assign by importing rosters automatically. Block off space for alternate use or maintenance issues to help prevent any assignment emergencies! Participant information is available at the click of a button and is easily updated. The participant profile details about the guest's room assignment and roommate. Email confirmation letters, contracts, invoices, and Excel documents. Manage and import conferences from contacts management database. Review building assignments by floor in monthly calendar view. Customize field labels and look-up lists. Set up default service items (meal plans, linen packages, room types, etc.). Create default billing rules with the ability to customize rates for specific conferences. Quickly locate conferences or participants with field search. Manage user access, operations, and report permissions through a security wizard. Block rooms in a graphical reservation calendar. 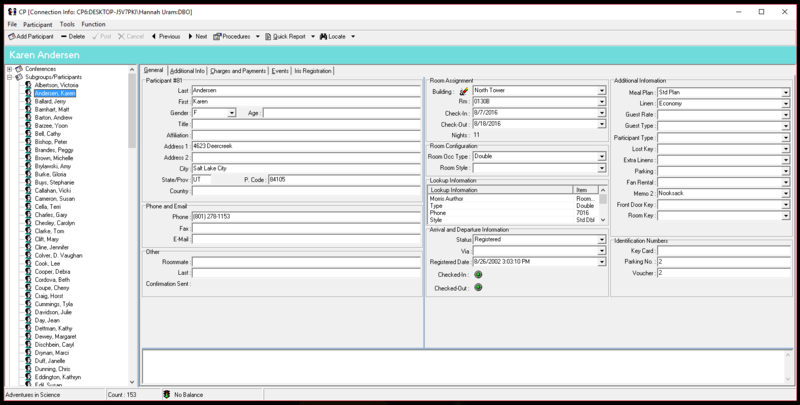 Quickly determine space availability within a specific date range. Generate and email blocked space spreadsheets to contacts. Import participant rosters directly into conferences and room assignments. Use drag and drop to change room assignments for individual beds or entire floors. Sort assignments by gender, age, room type, etc. Provide overflow options when more occupancy is needed. Develop master event lists for conferences. Allow participants to register for events online. Generate meal tickets, name badges, registration cards, key labels, and event rosters. Develop 'to do' lists and generate daily task tracking reports. Coordinate meal counts to dining halls with the meal planning wizard. Schedule catering events and generate catering reports with the catering wizard. Reserve space with the meeting room and resource scheduling wizard. Print housekeeping reports with room priority. Avoid assigning dirty rooms with the mark rooms clean wizard. Invoice and report charges on the individual, the subgroup, or conference. Define rates by conference for complete pricing flexibility. Record basic contact and billing information and service requests for each participant. Auto-charge groups for housing, meals, meeting rooms, catering, lost keys, parking, damages, etc. 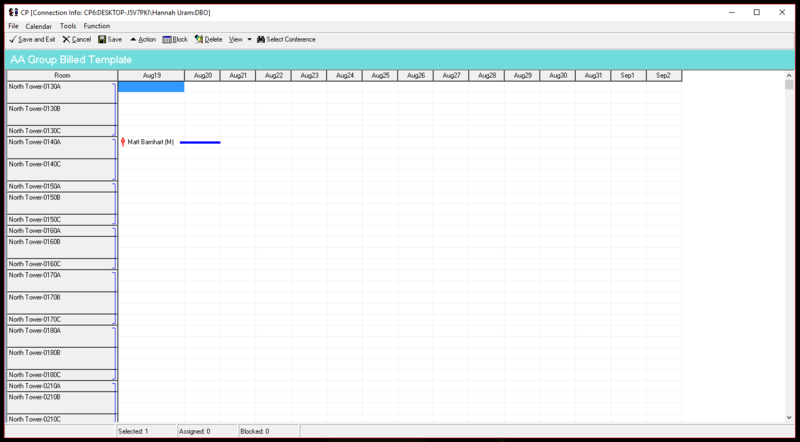 Create rate schedules that apply charges to groups within conference dates, and charges to individual participants outside of conference dates. 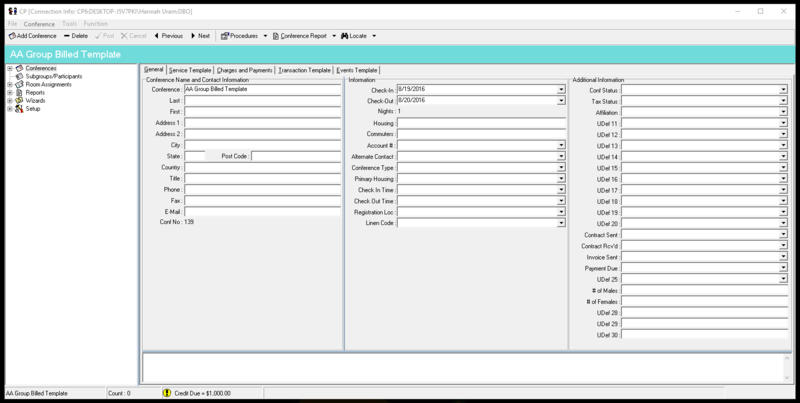 Provide client with itemized charge lists by conference and charge category. Bill for meals and catering by either the guaranteed or actual numbers. Bill for meeting rooms by the hour, half day, day, or flat fee. Track charges and payments by account, user, date, conference, and participant. Create comprehensive invoices for individuals, subgroups, or conference groups. Reconcile charges and payments with a reconciliation wizard. Track payments by user or cash box, or system-wide.